The herbalists at Essiac NorthWest, Humbleweed and Be Well Inspirations and many others have all contributed their time and effort to the Essiac Circle of Friends, a natural society of like-minded people continuing traditional native herbal healing in the spirit of the Seven Fires Prophecy. The Essiac Circle of Friends is a cooperative effort to provide the highest quality Essiac tea herbs on the planet. It is not in itself a corporation or business but some of the people involved have started their own retail outlets to provide these high-quality herbs to the public [See ordering page]. We are the people who plant, grow, harvest and supply these high-quality herbs to those in need. The Circle has evolved over several years with various people contributing to it and then moving on in the ever-changing ebb and flow of life. 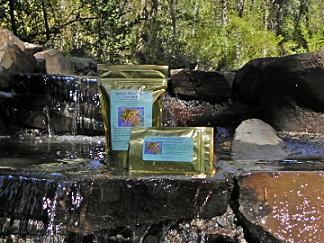 We have fifteen years experience growing, using and providing Essiac tea herbs worldwide to maintain good health. We also have decades of experience in using and crafting other herbal teas. Due to the increasing demand for high-quality Essiac tea herbs, we are having to work extra hard to keep up with that demand. 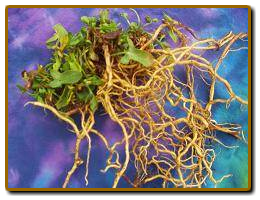 Unfortunately, high-quality, organically-grown sheep sorrel root is not generally available or easily found even on the internet. We have also found Essiac websites that make fraudulent claims about having sheep sorrel roots as well as incorrect information regarding the correct Essiac formula that Rene Caisse used. Therefore we actually reveal how we grow, harvest and process our sheep sorrel roots. Click here to read about our Essiac Herb Quality. We have been growing sheep sorrel on good, organic land. It is very time-consuming to trim the roots from the upper sheep sorrel plant. However, in spite of the extra cost it is necessary that people know how much sheep sorrel root is in each packet. Click on the "Growing Methods" and "Harvesting Roots" buttons above and see how we grow and harvest our sheep sorrel roots. Due to the high cost of growing, harvesting, clipping, drying, etc, of sheep sorrel roots and the high cost of suitable, unpolluted, organic land it is a challenge to keep up with the demand. CLICK HERE to learn what Rene Caisse said about the importance of sheep sorrel roots. We are experienced herbalists who specialize in providing high-quality, pre-mixed Essiac tea herbs. We adhere strictly to the documented formula and recipe for Essiac tea that nurse Rene Caisse was using after more than fifty years of research. Rene Caisse specifically stated that sheep sorrel roots were "very essential" to the Essiac tea formula. We derive most of our information and documentation from Rene Caisse, Mary McPherson, Sheila Snow, Mali Klein and Dr. Gary Glum. Sheila Snow* & Mali Klein have collectively written several well-documented books on Rene Caisse and Essiac tea. These books were the first credible handbooks in the world that reveal how Rene Caisse used various herbal combinations to treat cancer and other ailments. However, today many people drink Essiac tea simply because it is a well-known, pleasant-tasting tea for maintaining good health. To learn more about Essiac tea, the most accurate and documented online source is HealthFreedom.info. The sheep sorrel roots that we use as part of the Essiac formula are grown with organic methods without any pesticides, herbicides or artificial fertilizers in northern Idaho in mineral-rich soil that has never been farmed. The sheep sorrel leaf, burdock root, slippery elm and turkey rhubarb are certified organic. Click here to see how we harvest sheep sorrel roots. We also offer Bulk Essiac Tea Herbs with exact percentages of sheep sorrel roots. *Sheila Snow worked directly with Rene Caisse and both she and Mali Klein also worked extensively with Mary McPherson. Sheila spent 27 years compiling a priceless Essiac Archive collection of Rene Caisse's personal papers and correspondence, legal documents, the only existing clinic case records, many hours of tape recorded conversations, memorabilia and other documentation of Essiac history.